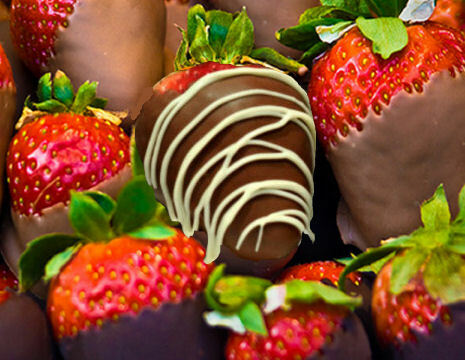 Anyone can dunk strawberries and other fruit into melted chocolate. It is easy and fast to do and makes a great looking party appetizer. But perfectly drizzled chocolate looks so much more professional. These cooking tips will make sure that your drizzled chocolate will rival those on any dessert tray. 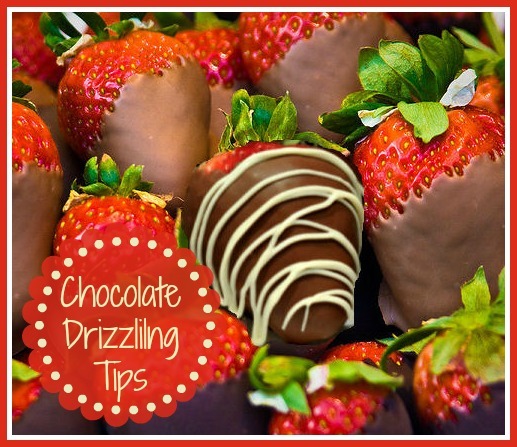 Perfectly Drizzled Chocolate is easy with this neat tip. Don’t think you have the artistic ability? Guess again. This tip for perfectly drizzled chocolate is easy to do. Start by coating your strawberries so that the ends of them are nicely coated. Set them aside and allow this to set. Just grab your trusty squeeze bottle. Now that I have said it, it seems obvious, doesn’t it? Unlike the plastic bag (or even a disposable piping bag), you can set the melted chocolate down and don’t have to worry about it making a mess on your counter tops. Plus, you have much more control while you drizzle! If you don’t have a few squeeze bottles in your kitchen, you can find them at a craft store or even the dollar store. While your chocolate strawberries are setting, just melt some white chocolate, (affiliate link) pour it into the bottle and start drizzling. (or reverse the colors and coat the strawberries with white chocolate and drizzle with dark. Whichever you choose, the trick is to be work quickly. If you want nice, thin, clean lines, you can’t give the chocolate any time to settle. Gently squeeze the bottle as you quickly move your arm (not just your wrist!) back and forth. Cover the area underneath with wax paper or aluminum foil so that the drizzle can extend outside the are you are working on. Your drizzle should start off of the item you are drizzling and extend a bit on either side. It’s hard to have an even drizzle if you are worried about getting it exactly. Just let it flow naturally, the extra drizzle will break off after the chocolate sets, and it’ll look perfect! Chocolate drizzle is great for more than just strawberries! Think about your favorite treats… Cookies, pretzels, nut clusters, graham crackers, and even bacon are all great for dipping and drizzling with chocolate! For more cooking tips please visit The Gardening Cook on Facebook.